Introduction: The ability of high-resolution computed tomography (HRCT) to depict the status of structure of the temporal bone represents a major advance in delineating pathology before surgical exploration of ear in cases of unsafe chronic suppurative otitis media (CSOM) or cholesteatoma. Aims and Objectives: The aim of this study was to evaluate the role of HRCT temporal bone in cases of unsafe CSOM and to assess the erosion of various structures in middle ear cleft. Study Design: This was a retrospective analysis. Materials and Methods: Fifty HRCT scans of temporal bone of the patients who were diagnosed as case of unsafe CSOM were selected and analyzed retrospectively. Criterion for inclusion was CSOM with cholesteatoma or granulations or polyp or posterior canal wall sagging or foul smelling discharge. In HRCT scans, 1 mm thickness sections were studied in both axial and coronal planes. Criterion for exclusion was history of previous ear surgery, history suggestive of head injury or skull base trauma in the past or known cases of temporal bone neoplastic pathology. Results: Maximum number of patients belonged to the age group of 21–30 years. Ossicular erosion was the most common (90%) finding followed by scutum erosion (84%). 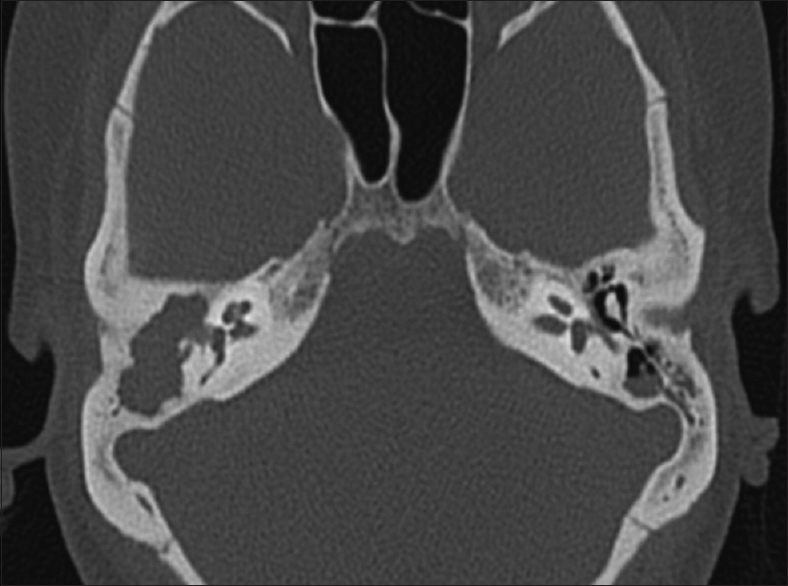 Erosion of sigmoid sinus plate was seen in only one case (2%). Cochlear promontory fistula was seen in none of the computed tomography scans. In ossicular chain, incus was the most common ossicle to be necrosed (92%) followed by malleus (66%). Conclusion: HRCT temporal bone delineates the location and extent of the disease and provides information on anatomical variations and complications. Chronic suppurative otitis media (CSOM) is a long-standing infection of the middle ear cleft. It is characterized by ear discharge and a permanent perforation of the tympanic membrane. Conventionally, it is divided into two types: tubotympanic (safe) and atticoantral (unsafe). In unsafe CSOM, cholesteatoma destroys the bones which come in its way such as ear ossicles, bony labyrinth, facial nerve canal, sinus plate, and tegmen tympani. This bone destruction results in several complications. Formerly, bone destruction was believed to be due to pressure necrosis, but currently, it has been attributed to enzymes. Diagnostic imaging techniques have always been supportive in diagnosis and assessment of extension of the disease preoperatively. Today, the use of conventional radiography is limited to the evaluation of mastoid pneumatization and to the assessment of the position and integrity of the cochlear implant electrodes. However, computed tomography (CT) is a radiographic technique that allows the measurements of small absorption differentials not recognizable by direct recording on X-ray films. The CT images provide exquisite bony details and excellent demonstration of soft-tissue density within the air spaces of the mastoid, external auditory canal, and the middle ear. 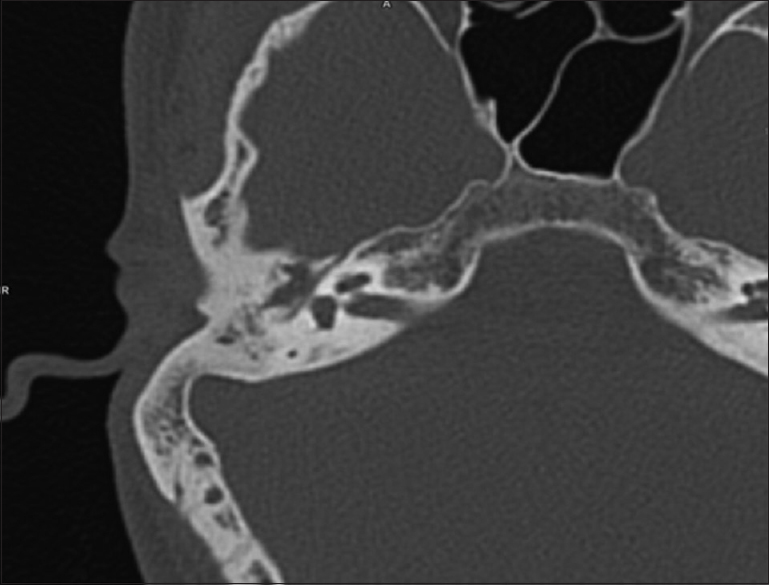 The radiographic appearances do not generally affect the surgical approach or the course of the operation which must be exploratory, but multidirectional or CT can demonstrate the soft-tissue mass of a small cholesteatoma as well as typical atticoantral erosion and ossicular disruption and destruction that occur. CT is needed when the diagnosis is in doubt, as when ear drum is obscured or when complication develops. The ability of high-resolution CT (HRCT) to depict the status of structure of the temporal bone represents a major advance in delineating pathology before surgical exploration of ear in cases of unsafe CSOM or cholesteatoma. To assess the extension of the disease or bone erosions of various structures in middle ear cleft. This was a retrospective analysis of 50 HRCT scans of temporal bone with a diagnosis of unsafe CSOM. Fifty HRCT scans of temporal bone of the patients who were diagnosed as case of unsafe CSOM and treated at the Department of ENT and Head and Neck surgery, SRMS Institute of Medical Sciences, Bareilly, Uttar Pradesh, from July 2015 to December 2016 were selected and analyzed retrospectively. The diagnosis of unsafe CSOM was mainly based on history, otoscopy, and findings on examination under microscope. Criterion for inclusion was CSOM with cholesteatoma or granulations or polyp or posterior canal wall sagging or foul smelling discharge. The information extracted from the clinical data included age, gender, presenting complaints, duration of symptoms, examination findings, and CT data. In HRCT scans, 1 mm thickness sections were studied in both axial and coronal planes. Criterion for exclusion was also made. CT scans of patients with a history of previous ear surgery, history suggestive of head injury or skull base trauma in the past, or known cases of temporal bone neoplastic pathology were excluded from the study. This study was based on a retrospective study of 50 HRCT scans of temporal bone in patients diagnosed with unsafe CSOM. The patients included in the study varied in the age group from 8 years to 50 years of age. Maximum number of patients belonged to the age group of 21–30 years. The youngest patient was 8 years old and the oldest patient was 49 years old [Table 1]. There were 30 male (60%) and 20 female (40%) in this study out of total 50 cases [Table 2]. Among the various radiological findings observed in these scans, ossicular erosion was the most common (90%) followed by scutum erosion (84%) as shown in [Figure 1] and [Figure 2]. Erosion of sigmoid sinus plate was seen in only one case (2%). Cochlear promontory fistula was seen in none of the CT scans [Table 3]. Among the radiological changes in ossicular chain, incus was the most common ossicle to be necrosed (92%), followed by malleus (66%). Beside the commonet sites of bony erosion seen in HRCT of temporal bone, erosion of horizontal segment of Fallopian canal More Details was quiet significant as shown in [Figure 3]. In comparion to erosion of sigmoid sinus plate (2 %), erosion of tagmen was more common (4%) as shown in [Figure 4]. Stapes' superstructure was not visualized in 20 (40%) cases [Table 4]. The diagnosis of cholesteatoma is usually made on otological examination in cases where diagnosis is not obvious. HRCT temporal bone may demonstrate a soft-tissue mass with characteristic ossicular displacement and erosion of the bone. Cholesteatoma in hidden areas may be revealed by radiological examination even if it is not detected clinically. In this study, it was observed that unsafe CSOM was most commonly diagnosed in age group of 21–30 years. It was slightly more common in males. In all the 50 cases, there was considerable destruction and loss of aeration of the mastoid air cells. Although CT scan is less sensitive in differentiating cholesteatoma from granulations, Mafee et al. believed that it was possible to identify cholesteatoma by its low attenuation value and Mafee et al. found that the presence of a well-defined edge to mass was a sure indication of cholesteatoma. In our study, bony erosions in the form of scutum erosion were present in 84% cases which was comparable to reports by Jackler et al. Mafee et al. found bone destruction in 9 out of 9 cases of acquired cholesteatoma. In our study, ossicular erosion was present, whether partial or complete, in 90% cases which is in consonance with Mafee et al. Garber and Dort and Jackler et al. detected ossicular destruction in 54 of 60 patients. In this study, incus was most commonly involved ossicle and CT could identify the erosion of incus in 92% of cases. Jackler et al. also had the same results. In this study, fallopian canal dehiscence was seen in 12% cases, which was consistent with the finding of Mafee et al. HRCT scans of the temporal bone have significantly enhanced the preoperative evaluation of unsafe CSOM. This study has shown that CT imaging for CSOM accurately depicts soft-tissue mass. It also effectively depicts the integrity or erosion of dural plate, sinus plate, lateral semicircular canal, lateral cortical wall, etc. The ear ossicles malleus and incus are well depicted in the study. However, we could not effectively depict status of stapes. The main limitations of the study were as follows: first, CT scan can be performed in different ways. It is not likely that these scans were performed in the most accurate way for scientific purpose since they were performed for clinical use. Therefore, small radiological changes could have been missed. Second, this was a retrospective study, so these findings could not be correlated with intraoperative findings. Hence, it is difficult to comment upon the sensitivity and specificity of HRCT temporal bone. HRCT temporal bone despite its pitfalls such as more radiation exposure and higher cost delineates the location and extent of the disease and provides information on anatomical variations and complications. It really serves as road map to assist the surgeon during surgery. This study was supported by SRMS Institute of Medical Sciences, Bareilly. Glasscock ME 3rd, Dickins JR, Wiet R. Cholesteatoma in children. Laryngoscope 1981;91:1743-53. Buckingham RA, Valvassori GE. Tomographic and surgical pathology of cholesteatoma. Arch Otolaryngol 1970;91:464-9. Proctor B. Chronic otitis media and mastoiditis. In: Paparella MM, Shumrick DA, editors. Otolaryngology (Otology and Neurotology). 3rd ed., Vol. 2. Philadelphia: WB Saunders; 1980. p. 1366. Ragavoodoo S, Agarwal MK, Srivasatava A. A comparative study between preoperative CT scan findings and operative findings in cholesteatoma of the middle ear cleft. Indian J Otolaryngol Head Neck Surg 2005;Special issue 2. Bluestone CD, Klein JO. Intracranial complications and sequelae of otitis media. In: Bluestone CD, editor. Paediatric Otolaryngology. 2nd ed., Vol. 1. Philadelphia: WB Saunders; 1990. p. 738-40. Mafee MF, Kumar A, Yannias DA, Valvassori GE, Applebaum EL. Computed tomography of the middle ear in the evaluation of cholesteatomas and other soft-tissue masses: Comparison with pluridirectional tomography. Radiology 1983;148:465-72. Jackler RK, Dillon WP, Schindler RA. Computed tomography in suppurative ear disease: A correlation of surgical and radiographic findings. Laryngoscope 1984;94:746-52. Garber LZ, Dort JC. Cholesteatoma: Diagnosis and staging by CT scan. J Otolaryngol 1994;23:121-4.